Through AEPi’s partnership with B’nai Brith International, international staff members participated in the Kakehashi Project, a program that brings Americans to Japan to experience Japanese culture first hand in hopes of building stronger bridges between Japan and America. 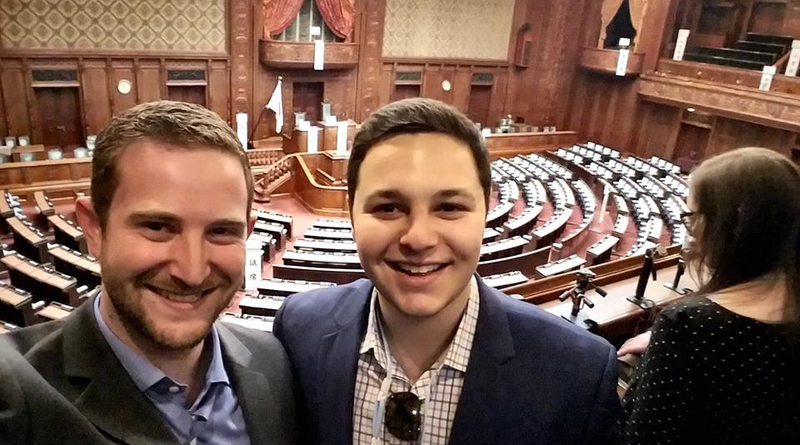 AEPi’s Director of Civic Engagement, David Marias (UC Davis, 2014) and Director of Leadership Development, Joshua Sushan (DePaul, 2016) toured the Japanese National Diet – along with a group of other Jewish professionals – where a briefing from the Middle East Division of the Ministry of Foreign Affairs was given on the relationship between Japan and Israel. When it comes to bringing peace to the region, Japan is as committed as the United States in ensuring an agreement is finally reached where both Israelis and Palestinians can coexist. Recognizing this is a long-term process, Japan will continue to offer resources to aid in the peace process. After learning about the current efforts, they had the opportunity to meet with Ambassador Yaffa Ben-Ari, the Israeli Ambassador to Japan, on the future of these efforts. Of all the efforts, the most notable is the Jericho Agri Industrial Park (JAIP). This joint Japanese-Israeli initiative is an industrial zone where Palestinian businesses have an economic pipeline to Israel and the rest of the world. With this zone, the Japanese hope they can aid in creating an environment where peace can thrive. Throughout the trip, both David and Josh were immersed in Japanese cultural experiences. From visiting the Fushimi Inari-taisha, a Shinto shrine in Kyoto, to participating in a Japanese tea ceremony, the AEPi staffers were exposed to a whole new way of life. More powerful than being immersed in Japanese culture was the opportunity for them connect to the Japanese Jewish community and meet a Holocaust survivor living in Japan. Living in Tokyo for the last 30 years, Mr. Janos Cegledy is a Holocaust survivor from Hungary and a world renowned pianist. He is the President of the Leschetizky Society of Japan and has toured the world. The trip ended with the group meeting Special Advisor to the Prime Minister of Japan, Mr. Kentaro Sonoura. Sonoura spoke about the Jewish American experience and overall Japanese-American relations. Sonoura also expressed excitement to see the future collaborations between Japan and the U.S.
Alpha Epsilon Pi would like to thank long standing partners at B’nai Brith International and AEPi’s new friends at the Ministry of Foreign Affairs in Japan. This exchange has both enhanced AEPi’s global Jewish message and shown another part of the world what being a leader in the Jewish community means.